Even though I still flounder in this agricultural language, I have linked bits and pieces of it to what I know to be true about God. His beauty and wonder are displayed here at ECHO and throughout creation; I have the opportunity to catch and document small glimpses of His indescribable majesty. Two weeks following my original seminar experience, Bruce held a seminar covering the biblical basis of ECHO. Since this was the topic that had sparked my interest from the beginning, the discussion engaged and inspired me. As we circled around the room reading various scripture passages, I lifted my eyes from the page to see the intense gaze of every other person in the classroom soaking up God’s truth. This incredible connection with the Creator and all He has made caused me sit back in awe. 1. God’s love for the world. When deciding whether or not to prune a tree, we must value the tree’s wellbeing first. ECHO’s primary goal is to love all people and creation as God does. One of the most famous verses in Scripture begins with God loving the entire world. This global focus, stretching beyond our personal circles, is a characteristic of Christ we try to emulate. 2. Stewardship of God’s creation. Pruning should be done for a purpose that ultimately benefits the tree. We must learn how to angle each cut in order to avoid unnecessary harm. God created human beings, intending us to be caretakers and preservers of nature. We are able to actively participate in this role at ECHO by recognizing how to properly tend to creation. 3. Creation proclaims the beauty and glory of God. Before mindlessly removing a branch, we must ask what its function is. We should be conscious of the fruit-bearing branches in order to preserve the tree’s production. God did not have to create fruit to hang off of branches, but He purposely made it this way. This reminds us to draw close in our relationship with Him. At ECHO, there are an endless number of natural metaphors which point us towards God’s character. 4. God provides for His creation. When pruning a tree, we are instructed to preserve the collar. A tree’s collar usually protrudes visibly from the trunk, as it is the place where the branch and trunk fibers come together. This woven intersection, if left intact, assists in protecting the tree from bacteria and fungi. God gave trees these collars for a reason. He knows what is best for each minuscule detail of creation and He provides just what we need. 5. Compassionate care for the poor and hungry. 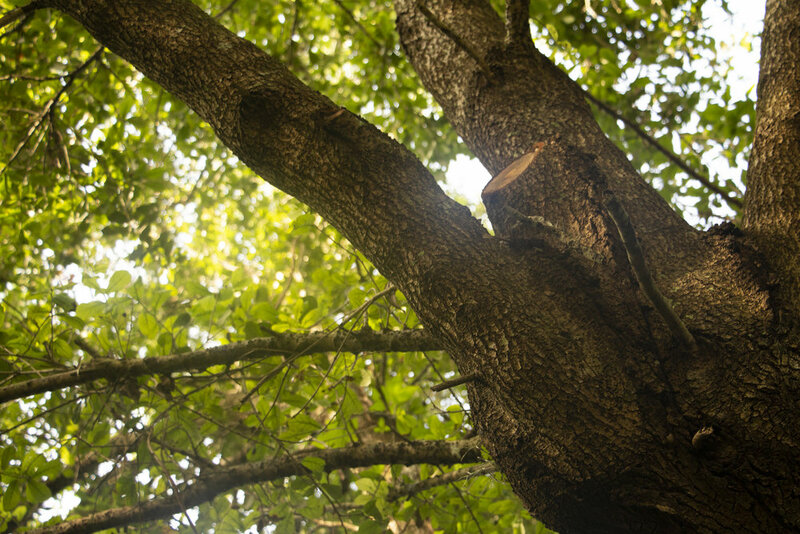 When we see dead limbs or removable hazards, we take action in pruning to the tree’s immediate need. We are called to do the same for our neighbors. When we see people in need, God commands us countless times throughout scripture to help them. ECHO has been blessed with abundant access to agricultural techniques and resources, so we then share these blessings with others. 6. The holistic breadth of the Gospel. No matter which method is used to prune a tree, the wounds it receives will last forever. The markings create scars within the bark, but all new growth will be unaffected and separated from any additional harm. Sin broke our intimate relationship with God, but Jesus’ sacrifice on the cross restored that connection. Along with humanity, all of creation shares in this brokenness and redemption. Here at ECHO as well as worldwide, both the consequence of sin and the gift of eternal life affect everything God created. If performed properly, the pruning done on any tree will exhibit the incredible power of renewal. When observing the tree’s recovery, the natural response will be to admire its adaptability and strength. Our words and actions have the power, through the Holy Spirit, to display the amazing mystery of the Gospel. When others ask about this unique fire burning in us, it should prompt us to respond with faith as our answer. In order to anticipate future storms or potential damages, hurricane preparation starts when planting. Trees that reside on poorly drained sites will be more prone to toppling. Mindfully pruning a tree from the beginning will help it stand, even amidst the most wicked storms. Here at ECHO, interns are prepared and taught while surrounded by an encouraging community. These months spent in Florida provide them the skills and tools needed to overcome trials they may face once entering the mission field. 9. Humble partnership in the Gospel. Espalier is the term used to describe the planting of trees in close proximity to a vertical support. If this process begins when the tree is young, it will grow alongside and often intertwine with the support system. ECHO works side by side with farmers, churches, and other organizations to reduce hunger while by improving agricultural production and sustainable solutions. We teach, learn, and grow with numerous partnerships so that all benefit from the interaction and input. I have been blessed with the opportunity to absorb these truths and process them in a tangible way at ECHO. My prayer is that these biblical concepts and practices can be used to prune and clean up our own lives. Let us plant these truths in our hearts and allow each one to flourish. //Jasmine is one of two 5-week storytelling interns at ECHO, and a student at Bethel University's Johnson School of Journalism. Follow the ECHO blog and ECHO News magazine for more of her work!